I am very intrigued by this graphic. 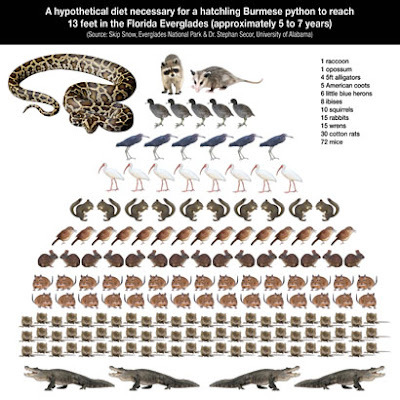 It shows what the non-native species of snake, the Burmese python, would devour in 5 to 7 years - by which time it would reach 13 feet. As you probably know, pythons (probably abandoned pets) have proliferated in this wetlands habitat and may now number tens of thousands, though no one knows for sure. A state-sponsored python hunt just came to an end with a tally of 37 of the snakes killed. Only 15 permits had been issued, though, and wildlife officials plan to issue 50 next year. But now there are also even meaner snakes to contend with: African rock pythons, compared to which "Burmese pythons are like pussycats."